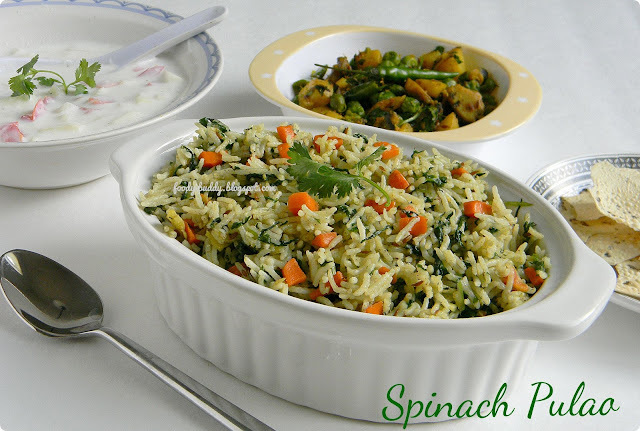 Spinach carrot pulao / spinach rice / palak pulav is a great one pot meal and easy to make dish. 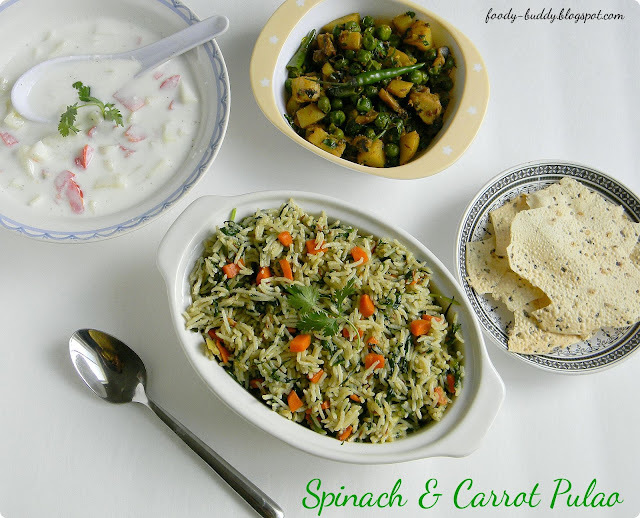 You can make pulao in different ways but this spinach pulao recipe is really authentic which has no onion and no garlic in it. This spinach rice is highly nutritious because of rich in iron, calcium and other vitamins. 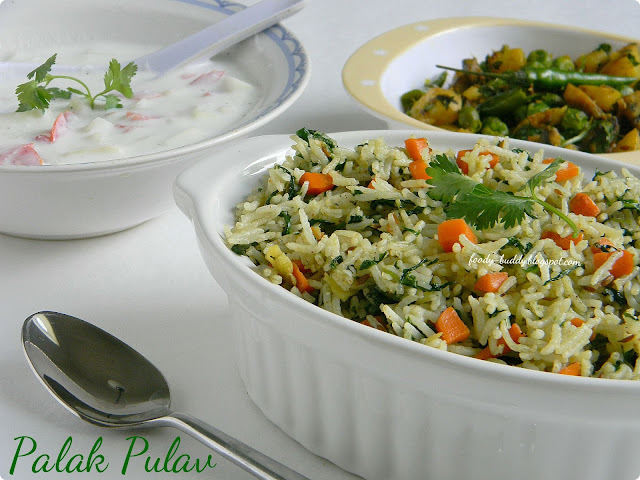 This palak pulao(pulav) is perfect for lunch. Serve with side dish like potato peas fry, papad and cucumber raita. Soak the basmati rice in water for 1/2 hr. Wash the rice for 1 or 2 times in a cold tap water and keep it aside. Wash and chop the carrot, spinach, green chilly and ginger. In a pressure cooker, heat oil, when it is hot, add whole cumin, after it crackles, add cloves, cinnamon, cardamom, bay leaf, fry for few mins. Add rice, fry for another 1 or 2 mins. Add enough water, mix well and pressure cook for 2 whistles. Turn off the flame. Let the pressure release on its own. Heat butter in a pan, add cumin and bay leaf, after cumin seeds crackles, add hing, green chillies and minced ginger, fry for 1-2 mins, add chopped carrot and salt, fry for 2 mins until it turns soft. Add spinach and garam masala, fry for few mins. In a low flame, add the cooked rice, mix gently until combined and cook for 2-3 mins. Turn off the stove. Finally add the lemon juice and coriander leaves, mix gently. Serve hot with papad and raita. You can add 1 big onion, if you want. If you have coconut milk, then cook the rice with coconut milk instead of water. Add ginger garlic paste instead of using minced ginger. If you don’t get spinach in your place, try it with some other greens. Black cardamom gives buttery taste to the rice. If you don’t get that, use the green cardamom. One cup of cooked spinach has 42 mg of calcium. Spinach is your best bet for folic acid, which helps keep cells all over the body growing and functioning well. It’s an incredible non animal protein source of iron, which delivers oxygen all over the body, providing much-needed energy to kids’ muscles. Spinach also helps regulate blood sugar and keeps your children’s hearts healthy because it’s high in potassium and magnesium. Improves brain function and cardiovascular health. It has a cancer fighting antioxidants.